New Year's is upon us with hopes, dreams, and endless lists for 2011. Before I began setting any knitting goals, I felt it necessary to take stock of the stash. Like most of us, that was easier said that done, especially since it appears the word "stash" has taken on new meaning, as buttons have begun to rival wool in my world. Specifically, I have this thing for vintage glass buttons, an itch Etsy is only too happy to scratch with a little assistance, of course, from Paypal. These just make me happy just to look at them. That is good because they do not actually work well with anything I have in my stash. The lovely lady over at Baby Cocktails designed a cool cardigan called Dark and Stormy. I purchased the pattern the other day and swatched with some gorgeous Madelinetosh Vintage in Fig. My gauge was actually spot on! Yay! Well, at least, I have the buttons sorted out. They are slightly smaller than the size called for in the instructions, but I think they will work nicely. The pattern is incredibly well written, and I am anxious to dive in, but I just have one question: Do the sizes listed include the 3" of ease through the body mentioned by Ms. Colman? Adding up the numbers on the schematic (and math is really not one of my strengths) suggests this is the case. For the size 44, the fronts are 10" each (20" together) and the back is 22.5" for a total of 44.5"; however, the button band attached to each of the fronts is 3". Assuming they overlap, that would add another 3", right? The total is now 47.5". Does that make sense? The problem with shopping for buttons online when one is mathematically challenged is that 3/8 of an inch does not really sound that small to me, after all, 3/8 is just a sliver less than 4/8 which I equate to 1/2. A half an inch isn't that small, is it? Yes, actually, it really is. These beautiful little porcelain buttons encased in silver are tiny, way too small for a sweater; however, they pair up nicely to some Madelinetosh sock a dear friend gave me. Together, they scream elegant neck warmer of some sort or gloves with buttons at the wrists, don't they? Speaking of blue, I have three skeins of some utterly fantastic Lobster Pot Yarns Whale of a Skein (80% wool, 10% cashmere, 10% angora) in Hydrangea that played well with a set of white glass buttons trimmed in gold. How about more than a little navy? The winner is probably one of the buttons in the first shot. Have I mentioned how much I love blue? My favorite blue yarn is a color called Old Kinsale by Curious Creek in Wasonga. In 2009 I received a skein as part of Woolgirl's sock club. I managed to collect three more skeins from Ravelry destashes; however, it was still not enough for a sweater for me (I wanted to use them double stranded). Finally, the lovely Kristine (the amazing artist and owner of Curious Creek) was kind enough to send me enough of this wonderful stuff to double my stash of it! I tried the same buttons from the navy above, but what made me smile was the swirly brown and white one with all the personality. We definitely have a winner, and I have no doubt this will become one of my all time favorite cardigans! After I matched up several of the yarns to buttons, I was a little disappointed, not with the matches, but my inability to find just the yarn for my favorite buttons. 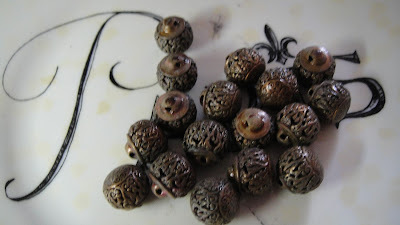 I have these wonderful little round metal buttons with open work that are just flat gorgeous, but they did not seem to go with anything I had. There are even seventeen of them! I tried them (way) above with the navy, but that really did not work. Then I tried them with the obsidian (Miss Babs Yowza), but as you can see from the picture below, the abalone shell vintage button works much better (the yarn color in the shot below is also more accurate). At best, they may work with the Frog Belly (Miss Babs Yowza again), but I am still not sure. As you can see, my 2011 will be filled with selfish sweater knitting...to make up for the dearth of sweaters from 2010. What does 2011 hold for you? Happy New Year to you, lady! I look forward to challenging your knitting in 2011, you and Alana are the lace mavens, after all. Wow! You've got some great choices to work with. Me? I need to finish some things! Glad you guys made it home safely. I cannot wait to see what you knit in 2011! The last photo (Frog Belly????) color is delish, what are you making with that? SO much to comment on here but first I have to say that I ADORE all your buttons (esp the brown swirly ones!). And I was amused that all your blue buttons didn't work on your blue yarns! Those porcelain ones are divine...I did not need another hobby, instigator! As for 2011? My goal is to PLAN my knitting. I really want to knit for spring in the next few months (such as that circular wrap) and then summer during spring, etc. so that I wind up with things I can wear when they fit the season. And, yes, turning UFOs to FOs and, finally, getting more socks on the needles. I think I was put off them with the never-ending "knee-hi's" for Trooper. I bet my new club offerings (MacKintosh Yarn) will aid in that goal! I hope that 2011 continues to bring you more acclaim and success!!! I think the round metal open-work buttons are my favorite, too! Matching buttons to sweaters, or anything, can be tricky. I bought some buttons online, and they turned out to be "not quite right." I've recently bought a couple of bags of buttons at an estate sale, a few from a stash at a fabric store - I'm getting too many. Too many that I'll never use. My plans, this year, are to finish up the 5 sweaters for myself that I've started over the past year and a half! FIVE! That's AFTER I finish the one for my DIL.